After performing the saddest duty of life at Samuel’s funeral life continues… but it is not, and can never be the same.Today marks four months since Samuel died, and I’m learning new things everyday about the impact of his death. Losing a child has a profound impact. Many families experience this pain, and there are a few families I know learning the lessons of grief too. 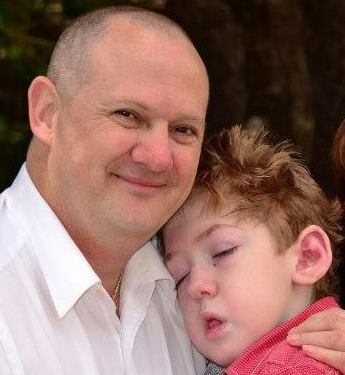 A consequence of having a child as special as Samuel is that you get to meet and know a lot of other families with really special kids and this year our network has experienced the loss of a few of these amazing little people, and a few more are struggling with declining health. I am learning the hard lessons about grief, I am sure there is a lot more to learn, but this is still a new way of life… so what have I learned so far? I am no stranger to death, I have witnessed it many times in my career. However, no matter how prepared you think you are intellectually for the death of those close to you, you can never be fully prepared emotionally for the loss and grief. Through all of the challenges that Samuel faced, and all the times that we were “prepared” for the fact that he was going to die, there is nothing…absolutely nothing that can prepare you for that moment. There is nothing that can prepare you for the sheer flood of emotions then, and in the days, weeks and months that follow. Yes there are all the “expected” things that you know are going to remind you. I expect to have feelings around photo’s of Samuel, around places that were important in our time with him. But the reality is that triggers are all over the place, and they can lead to sudden outbursts of emotion, and they happen in places and at times that you least expect them to happen. I was reading a book that included the detail of some psychology experiments that involved people washing and the impact the act of washing had on thought processes around a separate task… and before I knew it my mind had jumped to pictures of me washing Samuel for the last time before he died, and washing him after he died… both beautiful memories…. but memories that had me sitting in my office in a flood of tears, overwhelmed by a deep feeling of loss. This reaction has been triggered by songs, by other images, by conversations… by many things. grief might be, in some ways, the long aftermath of love, the internal work of knowing, holding, more fully valuing what we have lost. You can never regret having loved someone with all your heart, and grief is teaching me just how much love I had and continue to have for Samuel, and it is certainly teaching more and more about Samuel’s impact on my life. Some of the grief around Samuel has been with us for a long time, we had to grieve for the little boy he was before his accident, we still grieve for that version of Samuel. Then there was the “little stream of losses” along the way as Samuel deteriorated and was no longer able to do certain things. There’s the now of grieving for him. Missing him, noticing the differences that life holds without him. There’s the future of grieving from him…. thinking of all those things that he will never be a part of in our futures. It is messy and it is confusing. Most people have probably heard about the “stages of grieving” by Kubler-Ross… it’s a useful theoretical model for having an intellectual understanding of grief…. but like my experience of many other models for life “knowing” something does not prepare you for it……. and when it happens it’s not that clear cut…. it’s not stage 1 followed by stage 2 etc etc…. some days it’s every stage all at once, sometimes it’s 5 followed by one followed by 3….. there is no such thing as a linear process of grief it is messy and it is confusing. Then there is the anxiety that comes with grieving which is not something that the “models of grieving” discuss or have you expect…..the heart palpitations, shortness of breath and other anxiety symptoms that spring out of nowhere as part of the experience of grief. With the best of intention people will try….. yes, there might be some similarity in the events, and there is certainly the shared experience of broken hearts and loss….. but each and every experience is different. They didn’t lose Samuel… they didn’t have the relationship with him that is unique to me, the relationship that is unique to Jo-ann, or the relationship that is unique to Tanja or Taylor. So there is no way I could even begin to comprehend another families grief and loss… I can sympathise with the sense of loss and the broken heart but I will never know what it feels like to have lost their unique child… and they will never know what it is like to have lost Samuel. It doesn’t matter how many people are around, how supportive people are, and even in the midst of family…. the sensation of being completely and utterly alone can hit.. and nothing can shift it. Time does not heal the wound of losing a child, and nor would we want it too. To heal the wound would be in some way a signal that we have forgotten them, and we never want to forget them. In time scar tissue forms on the heart.. and that scar on our hearts is a reminder that they lived, a scar we WANT to carry with us because of everything it reminds us of. I miss my little man every single day, with every fibre of my heart. Life does go on, it’s not the same, and it never can be…. I will always love him, and carry him in my heart…. and continue to learn to how to grieve for him.